You understand the meaning of "Kaspersky" ! if you know the mean of that please comment to me, so , i and the people who dont know the meaning of Kaspersky can understand ! In the internet cafe beside my campus, there are many virus << of course infected not virus maker ! i pluged my flashdisk into the computer USB, when i arrive in my house directly, i switch on my computer and the kaspersky "piggg" immediately. My flashdisk contain Worm and Trojan ! 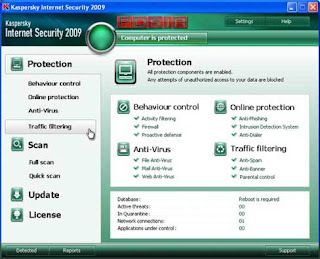 Kaspersky Antivirus 2009 or Kaspersky Internet Security 2009 can keep your computer from the "death word" ! i must sleep now to get the new strength for inject the "death word" into the girl heart! ( nowdiabolical@inbox.lv ) any other key that would work?! Nice blog . Thanks for sharing useful information about Kaspersky .Kaspersky is nice antivirus software . But i think Macrovirus oncall software is best for Kaspersky Anti-Virus . I am using Macrovirus oncall last 3 months and I have never any problems in my computer because i am using of Macrovirus oncall .